Meat grading has been a triumph of the Australian meat industry to provide both producers and consumers with reassurance of quality, but twenty years after its development, it is time to improve the knowledge with current technology. In a recent media release, Wiley and MLA announced that progress had been made in a research and development program focusing on augmented reality to enhance the way meat grading data is measured. In essence, augmented reality (AR) provides meat graders with a more consistent result on subjective characteristics such as colour and the area of the latissimus dorsi muscle. Currently, meat and fat colour and marbling are compared to swatches to determine the rating that contributes to the overall grading assessment, while area is approximated to a measured grid. Other elements of meat grading – temperature, pH and fat depth, are measured objectively using calibrated devices. The subjective elements of meat grading are therefore open to human error. Fatigue, poor training, a bad day, can lead to errors in these grading elements. While meat graders are highly trained, they are not infallible. Wiley and MLA have developed a prototype system ‘using computer vision, with the goal of objective measurement and decision support for grading staff. The innovative technology will help cement Australia as the world’s leading red meat producers, delivering high quality future supplies to domestic and international markets. ‘The AR platform, named ARGA (Augmented Reality Grading App) facilitates faster, more consistent and more precise meat grading while taking full advantage of the experience and capabilities of the industry’s meat graders. The solution is designed to distinguish the colour of a meat sample accurately and determine the area of the latissimus dorsi muscle and introduce hands-free scanning of meat sample tickets. So what is augmented reality in a meat processing sense? In its simplest form, augmented reality (AR) is a means of enhancing the visual perception of what the viewer can see. An example might be an architectural plan converted to a 3D model that allows you to ‘walk through’ your new home. Another application is to give greater representation of tumors to understand the extent and size of the growth that might not be able to be seen with conventional scanning methods. In a meat grading sense, it gives the grader are more accurate display of the test muscle that can be digitally recorded automatically. 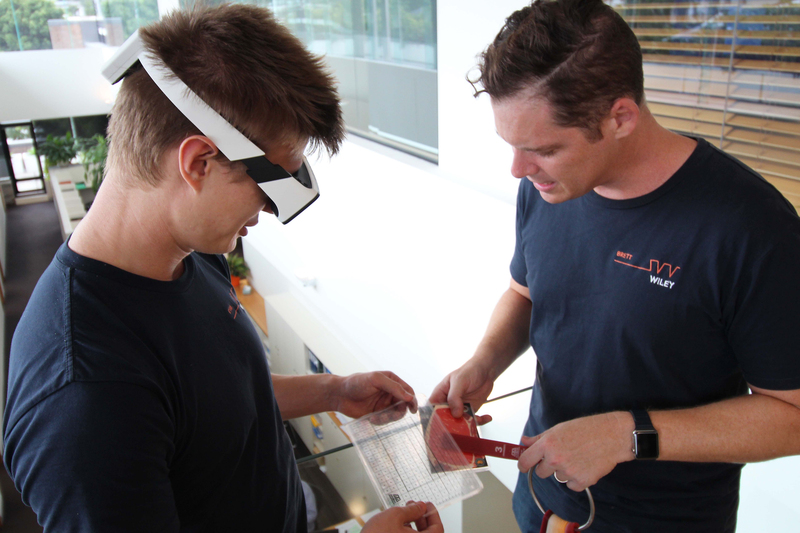 Most AR systems are via a headset or smart glasses, but the Wiley/MLA project has developed a mobile device app that can be potentially used on tablets or mobile phones. According to Brett Wiskar, Wiley’s R&D innovation director, the initial results of the pilot project have been positive. “Discussions with industry have shown that inconsistencies in meat grading are a problem for both the producer and the processor,” said Brett. “What we have seen so far is that the use of AR can give repeatable, reliable results for meat and fat colour, marbling and muscle area. “The system is not about removing the meat grader from the processing line, but improving the consistency of grading results. The very nature of a carcase is such that a grader needs to attend each one for the objective grading, but for the AR to work effectively, it may be necessary to rotate the carcase on the hook, adapt to light levels or move the scanner to gain the best possible aspect. “As the library of AR scans builds up, we can develop better grading assessments based on the knowledge we gain, which is difficult to do now. We have developed the hardware and beta level software that operates on an Android platform, but I don’t expect to see a commercially-viable system for at least 18 months.